CÓRDOBA, Argentina. In the opening match of their friendly series, Mexico had hoped to pull a surprise on Argentina with their Europeos in tow. 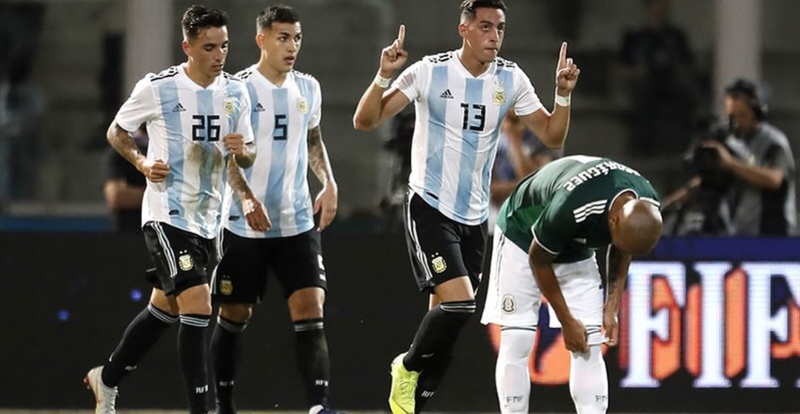 But a goal from Ramiro Funes Mori (44′) and an own goal from Isáac Brizuela (84′) helped Argentina defeat El Tri 2-0. Right from the opening whistle, El Tri nearly sprung the surprise goal. Off a moderate tempo transition, Marco Fabián played in Raúl Jiménez on a cross inside the area. Jiménez tried a diving header inside the six yard box, but it deflected off the crossbar and back into play. Soon after Jiménez’s failed header, Alan Pulido started a quick transition from the left flank and through his dribble, made a dangerous chance inside the area. However, Augustin Marchesin caught Pulido’s shot. But after a hopeful first few minutes for El Tri, Argentina started to adjust their pressure to make it harder for El Tri to connect on either long or short passes or play their defense head on. Failed shots from set pieces and controlled play by Lautaro Martinez and Nicolás Tagliafico in the middle phase of the first half became warning shots as to what would come next from Lionel Scaloni’s side on the way El Tri goal. Two of those early orchestrators for Argentina, Paulo Dybala and Renzo Saravia, would become the main antagonists against El Tri as soon as the match’s 38th minute. Then, Guillermo Ochoa has to react quickly to a shot by Lautaro Martinez. Martinez had latched onto Paulo Dybala’s long cross of a free kick from a sharp angle. Six minutes later, Ramiro Funes Mori took advantage of a broken 2-vs-1 off the corner kick to open the score. A moment of confusion for El Tri‘s defenders helped to facilitate both Paulo Dybala’s accuracy of the delivery on the set piece and Funes Mori’s placement of his scoring header. When the second half began, Mexico manager Ricardo Ferretti made four changes to his side, but they did not seem to help his side become more protagonistic and generate pressure on Augustin Marchesin’s goal in the second half’s early moments. Paulo Dybala and Lautaro Martinez both came close to scoring Argentina’s second goal in that time frame, both from evading at least one Mexico on the dribble. But El Tri were able to defend against the early pressure without Ochoa needing to make any heroic interventions and eventually generated a few second half chances themselves. On one of those chances, Angel Zaldivar finds Raúl Jiménez with a change of pace cross. But the Wolverhampton-based striker could not place his header underneath the crossbar. Argentina also gifted El Tri possession for about 18 minutes in the middle of the second half as Lionel Scaloni elected to change his side, and invite El Tri into mistakes in trying to break his Argentina side down. The momentary possession paid off as Mauro Icardi and Renzo Saravia worked off triangulation in the center of the attacking third to generate a dangerous chance for Argentina with nine minutes to play from the end of the 90. Several minutes later, the triangulation, except covering a larger surface area of the pitch, worked as it resulted in Isáac Brizuela deflecting Saravia’s cross into his own net to double the hosts’ advantage six minutes from the end of the 90. The goal sealed Mexico’s fourth defeat in five games played since the 2018 FIFA World Cup concluded, a run of form in which El Tri also failed to score in three of its last four matches. As for the Albiceleste, the victory was their third in their five post-Mundial matches. The two sides reconvene in Mendoza at Estadio Malvinas Argentinas in Mendoza on Tuesday, November 20. That match kicks off at 6:00 PM EST (UTC -5).